My first ceraphronid... I wish I had gotten better photos, but I had only taken several shots at 1x before it flew away. Charley, can you estimate the body length and/or provide any other angles? It was about 1.5 mm. Unfortunately the other shots all are the same angle and out of focus, except the one shot I've just added, which shows a little more detail of the thorax and wings. In your second image, you can see the prepectus, which appears in chalcids, but not in scelionids. This helps a great deal because the antennal insertion point (which helps separate these two groups) is difficult to see in these images. 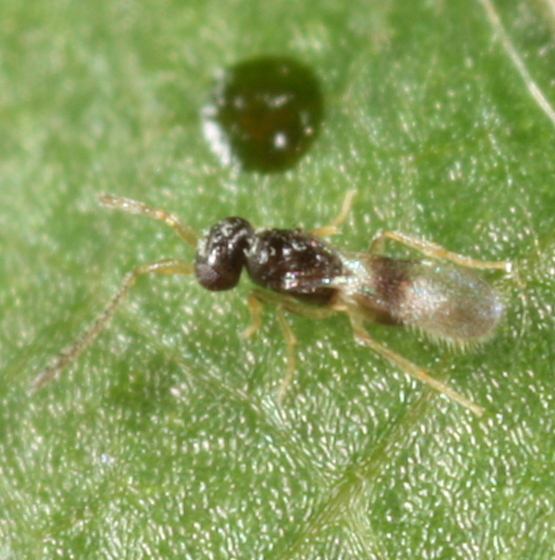 Being a chalcid, this would likely be a mymarid due to the tiny size, long antennae, and wings with a marginal fringe. You can also see the spatulate hind wing a little more clearly. Additionally, there are examples mentioned in the literature of mymarids with infuscated wings. That one other angle made the difference here I think.